Home › Press Room › News › Magneti Marelli Automotive Lighting and the Carnia Industrial Park inaugurate a new production site in Tolmezzo. Magneti Marelli Automotive Lighting and the Carnia Industrial Park inaugurate a new production site for car lighting electronics in Tolmezzo. The new pavilion is located in the Carnia Industrial Park, inside the production complex of Automotive Lighting, one of the world leaders for car lighting. 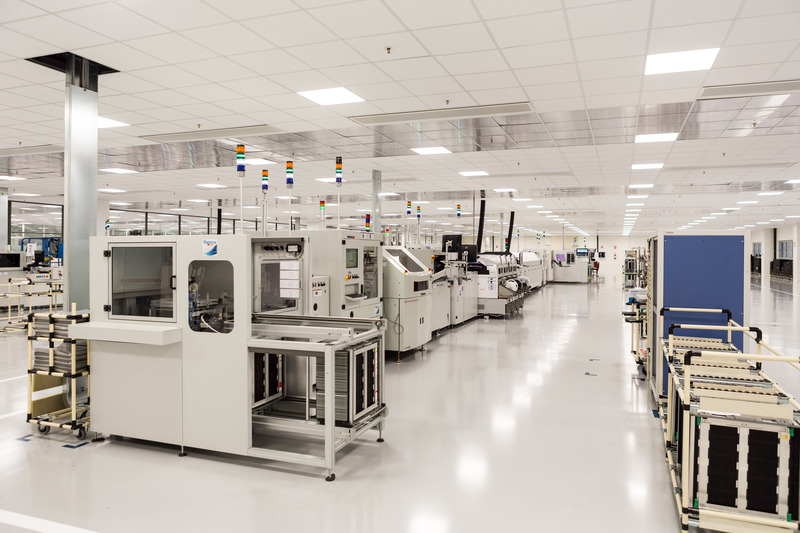 The new area of over 5,000 square metres is dedicated to the production of electronic components for LED lights. The entire Automotive Lighting complex in Tolmezzo employs over 1,100 personnel (approximately 300 added since 2011) and supplies the top-line models of the most important car manufacturers worldwide. Today, Magneti Marelli Automotive Lighting and the Carnia Industrial Park inaugurated a new pavilion dedicated to the production of electronics for LED rear lighting for cars in the production complex in Tolmezzo (UD) in Friuli Venezia Giulia. The new industrial site has production lines for circuit boards and will be completed by a design centre specifically dedicated to electronics for rear illumination for cars. The new construction covers an area of over 5,000 square metres of production space, and is located within the Carnia Industrial Park, which created the infrastructure, as part of the Automotive Lighting industrial complex in Tolmezzo, a Magneti Marelli centre of excellence on an international level for rear lighting. The entire Automotive Lighting complex in Tolmezzo currently covers an area of 102,500 square metres, of which over 32,000 are covered, with a certified production capacity of over 4.8 million pieces a year. The Tolmezzo site is the most important industrial entity in Carnia and one of the most important in Friuli Venezia Giulia, with a number of employees which, from 2011 up to the present date, has grown by approximately 780 to the current number of 1100 employees. Over the last three years, Magneti Marelli Automotive Lighting has invested approximately 25 million euro in production capacity in the Tolmezzo plant. The Tolmezzo site is situated in a logistically strategic position regarding the automotive production centres of Central-Eastern Europe, supplying the most important brands worldwide, such as BMW, Daimler-Mercedes, the FCA group (Alfa Romeo, Jeep, Maserati), Ferrari, Ford, GM-Opel, the Volkswagen Group (Audi, Porsche), Volvo and others. As well as the central body of the main production plant and the new pavilion, the complex also includes a Research and Development centre which, since 2000, has designed approximately 320 different types of light for approximately 200 car models, and has introduced important innovations including lights with a “light curtain” effect, 3D, and other dynamic solutions. The same industrial perimeter also contains the Mould development and production Centre, which constitutes a unique concentration of process technology and produces moulds for rear lights for all Automotive Lighting plants worldwide. The inauguration saw the presence of the President of the Friuli Venezia Giulia Region, Deborah Serracchiani, Pietro Gorlier, Managing Director of Magneti Marelli, Mario Gollino, President of the Carnia Industrial Park, Francesco Brollo, the Mayor of Tolmezzo, as well as the most important institutions in the area and the management of Magneti Marelli and Automotive Lighting. The extension of the productive area represents a concrete example of collaboration between local and regional institutions and the industrial world. In fact, the Carnia Industrial Park and the Friuli Venezia Giulia Region have worked together to optimise the time necessary to find a functional solution to meet the new requirements of production in Tolmezzo. In particular, the Carnia Industrial Park has created the new production infrastructure, which is leased to Magneti Marelli through public procedures. The Carnia Industrial Park carries out its role for the territorial development of the mountain area of Friuli Venezia Giulia region as part of an industrial policy oriented at the attractiveness and exploitation of manufacturing. The Industrial park represents a competitive and integrated territorial system of businesses, institutions and services in a prestigious environmental context which is ideally located for Northern and Eastern European markets. A productive and economical centre which the Carnia Industrial Park aims to present as a point of reference for the manufacturing industry, exploiting the presence of examples of excellence. The new productive infrastructure created for Magneti Marelli Automotive Lighting is emblematic, with an investment of 6 million euros, finished in only 220 days (work beginning on 20 April 2016, 1st and 2nd consignment of buildings on 14 and 28 November respectively), during which time between 7 and 14 companies were involved, with an average presence of 31 workers/day. “This new productive infrastructure allows us to further optimise the performance of the plant and render it even more competitive - declared Pietro Gorlier, CEO of Magneti Marelli - in a market context which demands continuous innovation and the highest levels of quality. The Tolmezzo plant as a whole is an example of excellence which has favoured the introduction of LED technology and electronic solutions for rear lighting for cars. This new structure is not only a productive pavilion with cutting-edge machinery, but also a concrete example of constructive and intelligent teamwork between institutions, territorial bodies and private industry. Teamwork which has created benefits for the territory and the company, and which exploits the quality of an extraordinary workforce”. “We are delighted and proud to be able to present this new productive infrastructure which supports a process of growth and consolidation for Magneti Marelli Automotive Lighting in Carnia - declared Mario Gollino, entrepreneur and President of the Carnia Industrial Park. The increase in job positions and the effects on income constitute the scale of the immediate social and economic return on the investment made, with the contribution of the region. The professionalism of the personnel of the Carnia Industrial Park and the companies selected for the construction of the infrastructure has allowed the obtaining of this fantastic result in full respect of the timing and the quality of the technological solutions adopted”. The new pavilion was created in light of the constant growth of Automotive Lighting in Tolmezzo over the last few years in terms of business volume and contracts, and the consequent necessity to gain more space. In particular, the new construction will allow an even more efficient and linear organisation of the areas for the creation of plastic components and circuit boards, as well as the creation of new areas to be adapted to logistics and assembly. The growing complexity of LED lighting requires ever more integration between traditional light components (plastic moulded parts and wiring) and new electronic components. 80% of production in Magneti Marelli Automotive Lighting in Tolmezzo is in fact dedicated to LED lights in which all functions; stop lights, indicators, reverse lights and rear fog lights, are made with electronic components. Nowadays lights are illumination devices with a highly technological content, which has an important role in modern cars in terms of design, safety and consumption/emissions. LED technology has, in fact, paved the way for the application of designs which would be unimaginable with incandescent light bulbs, offering completely new solutions and “free” forms to the design centres of car manufacturers. From a safety point of view, LED rear lights have a shorter activation time, which, at 120 km/h means a significant reduction in the stopping distance of the car behind. LEDs also have a life expectancy equal to that of the car itself, and consume approximately a fifth of the energy consumed by a traditional bulb: this energy efficiency translates in lower fuel consumption and reduced carbon dioxide emissions. Magneti Marelli Automotive Lighting is the division dedicated to the development of technologically advanced automotive lighting solutions. With an annual production of approximately 21 million headlights and 28 million lights, it represents one of the most commercially important areas for Magneti Marelli as well as one of the main global players in the field of lighting. Automotive Lighting has introduced the most important technological innovations of the last 15 years in the automotive lighting sector: xenon dynamic curve lighting in 2003; the first headlights with an active infra-red module in 2005; the first Full-LED headlights in the world for mass production (for the Audi R8) in 2008; the first headlights in the world fitted with an active infra-red night-vision system (2011); the first adaptive Full-LED headlights (for the Mercedes-Benz CLS) in 2010; the first application in the world of laser technology for mass-produced vehicles, thanks to an additional laser module for headlights (the new Audi R8 in 2015. Magneti Marelli designs and produces advanced systems and components for the automotive industry. With 89 production units, 12 R&D centres and 30 application centres in 19 countries, approximately 40,500 employees and a turnover of 7.3 billion Euro in 2015, the group supplies all the major carmakers in Europe, North and South America and the Far East. The business areas include Electronic Systems, Lighting, Powertrain, Suspension and Shock absorbing Systems, Exhaust Systems, Aftermarket Parts & Services, Plastic Components and Modules, Motorsport. Magneti Marelli is part of FCA. Carnia Industrial Park promotes the social and economical growth of the Carnia area, a mountain area in the Friuli Venezia Giulia Region, and today represents an integrated system of businesses, institutions and services. Carnia Industrial Park contains over 200 businesses employing over 3500 workers, spread over the three industrial areas in the municipalities of Tolmezzo, Amaro and Villa Santina. The industrial areas have an overall area of 247.50 urbanised hectares, supplied with innovative technological and computer networks, transport systems and modern industrial plants created with full respect for standards of ecological sustainability and energy saving. Magneti Marelli Automotive Lighting and the Carnia Industrial Park inaugurate a new production site in Tolmezzo.